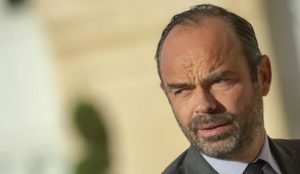 Edouard Philippe will never admit it, but here is why anti-Semitism in France is up 69 percent: the Qur’an depicts the Jews as inveterately evil and bent on destroying the well-being of the Muslims. They are the strongest of all people in enmity toward the Muslims (5:82); they fabricate things and falsely ascribe them to Allah (2:79; 3:75, 3:181); they claim that Allah’s power is limited (5:64); they love to listen to lies (5:41); they disobey Allah and never observe his commands (5:13). They are disputing and quarreling (2:247); hiding the truth and misleading people (3:78; staging rebellion against the prophets and rejecting their guidance (2:55); being hypocritical (2:14, 2:44); giving preference to their own interests over the teachings of Muhammad (2:87); wishing evil for people and trying to mislead them (2:109); feeling pain when others are happy or fortunate (3:120); being arrogant about their being Allah’s beloved people (5:18; devouring people’s wealth by subterfuge (4:161); slandering the true religion and being cursed by Allah (4:46); killing the prophets (2:61); being merciless and heartless (2:74); never keeping their promises or fulfilling their words (2:100); being unrestrained in committing sins (5:79); being cowardly (59:13-14); being miserly (4:53); being transformed into apes and pigs for breaking the Sabbath (2:63-65; 5:59-60; 7:166); and more. They are under Allah’s curse (9:30), and Muslims should wage war against them and subjugate them under Islamic hegemony (9:29). Anti-Semitic acts in France rose by 69 percent in the first nine months of 2018, Prime Minister Edouard Philippe said on Friday, as Jews in Europe and around the world marked the 80th anniversary of the infamous “Kristallnacht” Nazi pogrom against Jews. “Every aggression perpetrated against one of our citizens because they are Jewish echoes like the breaking of new crystal,” Philippe wrote on Facebook, referring to the start of the Nazi drive to wipe out Jews on November 9, 1938, also known as the Night of Broken Glass, according to AFP. “Why recall, in 2018, such a painful memory? Because we are very far from being finished with anti-Semitism,” he said, calling the number of acts “relentless”. After a record year in 2015, anti-Semitic acts fell by 58 percent in 2016 and went down a further seven percent last year, however there was an increase in violent acts targeting Jews…. The government plans to toughen rules on hate speech online next year, pressuring social media giants to do more to remove racist and anti-Semitic content….